Environmental responsibility has swept the nation. From large-scale corporations planning their next convention or board meeting to the individual small-scale client, people are searching for new ways to incorporate earth-friendly products and services into their venues. For caterers, this means finding the most cost-effective way to meet the public’s ever-growing “going green” demands. Restaurantware.com has an ecologically sound line of disposable bamboo plates, bamboo serving boats, bamboo skewers and catering supplies that are as practical as they are beautiful. Bamboo, the fastest growing plant on earth at a rate of 24-36” every twenty-four hours, is 16% harder than maple and is naturally ECO-friendly and biodegradable…and because bamboo is sustainable and can be grown without any pesticides of chemicals, it decomposes completely without any pollutants. Bamboo is also naturally anti-microbial. Its natural resistance to mildew and mold can be helpful in environments where there is a lot of moisture. Because bamboo also happens to be an effective insulator, items made of bamboo–such as Restaurantware.com’s bamboo serving canoes, bamboo cone, bamboo skewerws and bamboo bowls–will keep your hot foods hot and your cold foods cold. Supporting bamboo planting by using products made from the plant can also help the environment simply because of the nature of the plant itself. Bamboo produces greater biomass and up to 30% more oxygen than a comparable forest. It reduces carbon dioxide gases and regenerates automatically without any need for replanting. Bamboo can also restore and remove toxins from damaged and contaminated soil. It can also prevent soil erosion and even helps to alleviate water pollution. 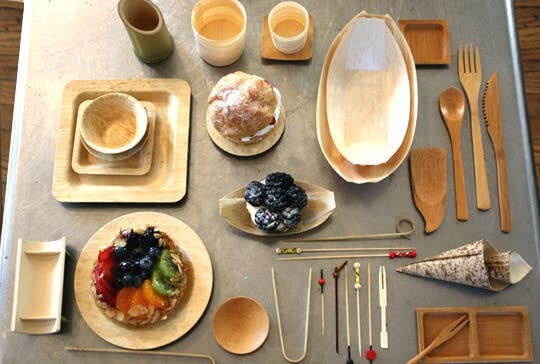 So, you can now not only reduce your carbon footprint by simply using a reliable, sturdy, biodegradable product like Restaurantware.com’s bamboo tableware, but you can further your positive impact on the environment simply by encouraging the growth of bamboo forests. Stylish and affordable, Restaurantware.com’s bamboo line is eco-savvy, durable, and expertly crafted to suit the needs of your clientele. Restaurantware.com is answering the growing demand of businesses and consumers who are looking to reduce their carbon footprint and live a greener lifestyle by offering environmentally-friendly biodegradable tableware, plastic champagne flutes and plastic wine glasses for events, business meetings, wedding parties and more. For more information, or to view the complete catering supplies and plastic plates line, please visit www.restaurantware.com. You can e-mail us at service(at)restaurantware.com or reach us by telephone at 1-800 851-WARE(9273).